The “Blog” of “Unnecessary” Quotation Marks: Well. Right. I'll let Elizabeth explain this one, "This sign is near my home in Seoul, South Korea. I don't understand it, but I think they deserve extra credit for the artistic placement of the closing quotation." 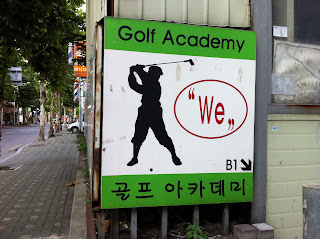 Has anyone considered that "We" in Korean might be equivalent to yelling "Fore!" in English? Also, we may use quotation marks that are at the same height, but I believe that Korean (and some other countries) use them with the first one up and the second one down. This is not a mistake but convention for this language. According to Wikipedia, there is a Korean family name that is normally transliterated as "Wi" but can be transliterated as "We". Maybe they meant to say "Wheeeee!" I couldn't help but notice that the golf swing looked more like a baseball swing ? ?